The second day of our stay in Gujarat took us to an interesting place. A town with an old heritage, which grew to become the capital of Gujarat, flourished for decades, was attacked, sacked and then left in ruins to be forgotten for another three centuries when it was discovered again to be considered as a World Heritage Site. This is the walled city of Champaner, which along with the hill fort and temple of Pavagarh is called the Champaner and Pavagadh Archeological Park. Our trip to Champaner started at 8 AM in the morning. Since the place is around 45 km from Vadodara where we were staying, we were supposed to go by bike. But it so happened that there was heavy rain the night before and there were light showers in the morning too. So we decided to take a cab, the driver was not very friendly and cribbed when asked to show around, but we were happy to have managed to see the place. 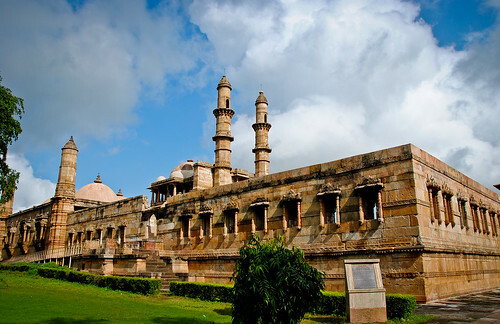 Champaner traces its history to the Rajputs of the Chavda dynasty, the rulers of which founded it in the 8th century. In the 15th century, it was ruled by the Chauhans when Muhammad Begda attacked and captured it from the Rana in 1484 AD and renamed it Muhammadabad. This battle was marked by Jauhar and Saka of the Rajputs where the women folk jumped into a holy pyre to escape dishonour at the hands of the Muslim invaders while the men marched for the last battle. The town went through a period of extensive construction and growth and became the capital of Gujarat. The fate of Champaner reversed after an attack by the Mughal emperor Humayun in 1535 AD. 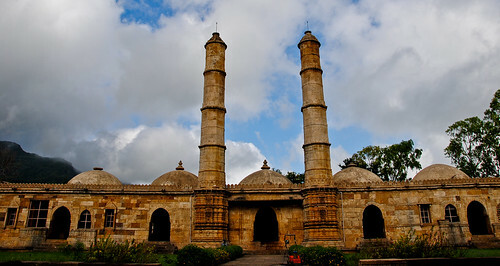 The capital was moved to Ahmedabad and Champaner went into a long period of gradual decline. When it was rediscovered by the British, it was a ruined city with most of the population gone and only rundown buildings giving an indication of its glorious past. We were fast asleep by the time we reached Champaner. I woke up with a start to find the car going through a giant stone gateway flanked by high ramparts. On our right-hand side was a lake which was overflowing and water was coming on the road. We crossed this and reached what we perceived as the main gate of the fort. The first monument we came across was called Shahar ki Masjid. It was an imposing structure made of five mihrabs and five arched entrances and said to be the private mosque of the Royal family. We were awestruck by the beautiful towers and carvings at this monument, with a feeling that unknowingly we had landed at a treasure trove of architecture. We left the mosque through the winding bylanes of Champaner to see what else was in store for us. The next monument we came across was the most imposing and beautiful of all, the Jami Mosque. A perfect blend of the Indian and Islamic architecture, this huge structure is classified archaeologically as one of the finest in Gujarat. The building is built on a high plinth with five-point archways and minarets flanking the central arch which run as high as 30 mts. The building is also remarkable for its intricate carving and perforated stone screen work. At the four corners were also four minarets, out of which only two remain now. The intrados of the domes are carved with great beauty and are a fine specimen of peerless craftsmanship. We went to a place called Kabutarkhana. This was basically a leisure place at the side of a big lake called “Badaa taalav”. 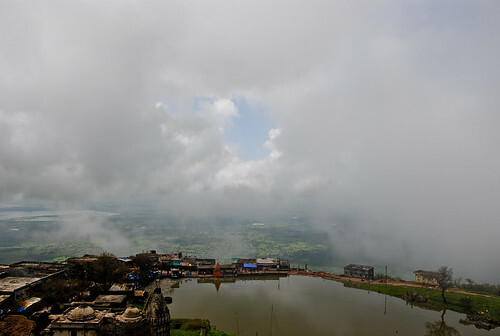 From here, you can watch the hill of Pavagarh rising above the clouds. Next in line was a Mosque called the ‘Kamaani Mosque’ which means the Arched Mosque. The mosque rose on beautiful arches built in the Sultanate style and looked beautiful even in the ruined state. At this point, since we were short on time, and since the stupid driver was too unwilling to show us around, we decided to leave for Pavagarh. For that, we had to take a Mahindra Trekker to a place from where we were supposed to take a rope-way imaginatively called “Udan Khatola”. The ride on that jeep was something, the driver gave a new meaning to the word ‘overloading’ – 5 people on the driver’s seat, 5 at the middle, 6 at the back and at least 4 ‘standing’-hanging precariously on the outside! So after a jam-packed journey, we reached the roadway station, booked our tickets and got in. The climb up was nice, the view of the outside was terrific with the green valley below us and clouds above. 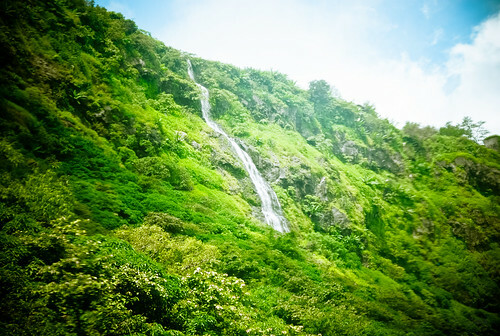 We could even spot a waterfall at some distance. Pavagarh is famous for an old temple dedicated to Shakti. 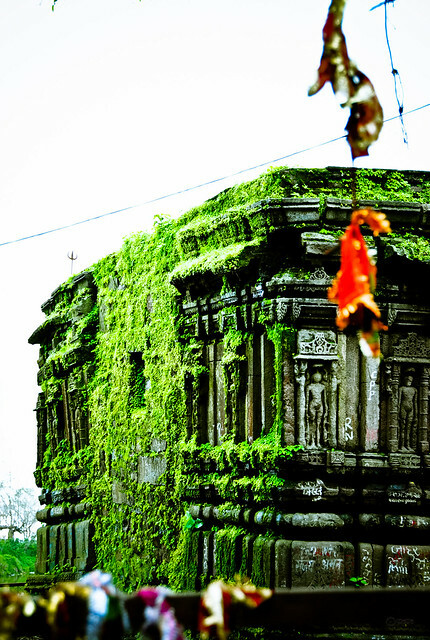 There are also ruins of a Jain temple and some other buildings of bygone era. The hilltop has a small lake which is used by the people living there. Although the place is beautiful, it is extremely dirty with garbage strewn all around. I hope that we Indians learn to be a bit more community hygiene conscious soon, the current levels of civic sense border near disgusting. After having the customary darshan at the temple, we took some photographs, but the piles of garbage were so unnerving that we decided to come back. So one ropeway trip down and we were back at the Jeep stand. While coming down, we saw some old structures off the road and decided to get down and do some exploration of our own. This is how we came across the impressive gateway and the Bawaman mosque which was being restored by the ASI folks, down to the last detail. 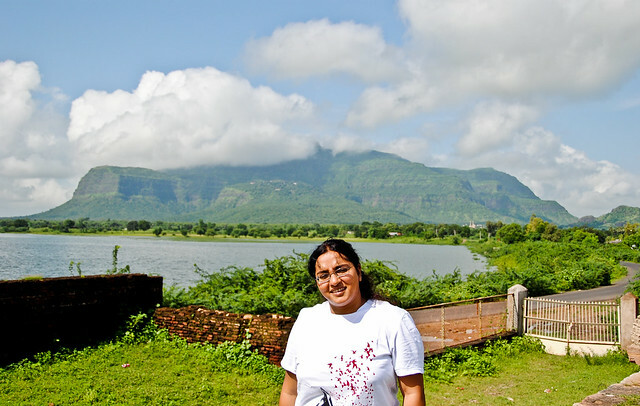 It took a mini trek for us to reach the base but the view along the way was nice with lush greenery and slight drizzle.Although I was mesmerized by the architectural and natural beauty of Champaner and Pavagarh but was not totally satisfied. While Champaner fares much better, the condition of Pavagarh, especially the temple area at the top leaves a lot be desired. Once more reason was that we could not cover all the places in Champaner with some major buildings being left out. So planning to pay a second visit and update the Gujarat chronicles soon. Champaner-Pavagarh, a set on Flickr. I loved your pictures of the monuments a lot. I was so worried about the rain water affecting my camera that most of my pictures are quite bad. First class piece of writing! !